Solstice Multi-Room enables meeting participants to share content collaboratively across multiple locations and geographies on the same enterprise network. When two or more Solstice Enterprise Edition Pods are synced in a Multi-Room session, shared content will appear on all Solstice displays in the session regardless of which room or location shared the content. Solstice Multi-Room requires no additional hardware and comes standard with Solstice software version 3.0 or later for Enterprise Edition Pods. The Multi-Room feature also allows all participants in the Multi-Room session to view information on how to connect to your existing voice and audio systems, such as a dial-in number for your audio conferencing. The Multi-Room feature requires Solstice Enterprise Edition licenses. For more information about upgrading your Pods to Solstice Enterprise Edition licensing, please contact us. Multi-Room is available on Pods running Solstice version 3.0. The Solstice App on each user device must also be updated to version 3.0 or later. The Multi-Room feature must be enabled in the Solstice Dashboard (Security tab > Access Control section > Start/Sync Multi-Room session enabled). Note: Screen key will automatically be enabled when the Multi-Room feature is enabled and cannot be disabled until Multi-Room is disabled. In the Access Control section, select the Start/Sync Multi-Room session enabled Screen key will be enabled automatically. On the prompt that appears, click Yes, enable Multi-Room. Open the Solstice app and connect to the Solstice display. Click Meeting, then click Start Multi-Room Session. In Session Name, enter in the name you would like to give the multi-room session. Note: Multi-room session names will be visible in the Solstice app’s discovery list for all users connected to the network. In the Add an audio bridge field, enter in the audio/video conferencing information you would like to relay to other meeting participants such as a direct phone line, a conference bridge and PIN, or a VTC link. This information will be visible in the Solstice app to meeting participants that have joined the multi-room session (Multi-Room tab/panel). For example, if you want other meeting participants to call in to the meeting, you can enter in the number of the direct phone line in your meeting room. Click Start Multi-Room Session. The multi-room session is started, and the Multi-Room panel opens on your Solstice app. Open the Solstice app. On the Discovered Displays tab, the available multi-room sessions will be listed. Click the multi-room session you would like to join. Enter the screen key visible on the display you wish to connect to the multi-room session. A prompt asking if you would like to join the multi-room session from your display will appear. Click A request is sent to the meeting participants in the multi-room session for approval. Once approved, your display will be connected to the multi-room session. Click the multi-room session you would like to join and enter the screen key visible on a display connected to the multi-room session. Once connected, you will be able to share content to the session that is visible on all the connected displays. 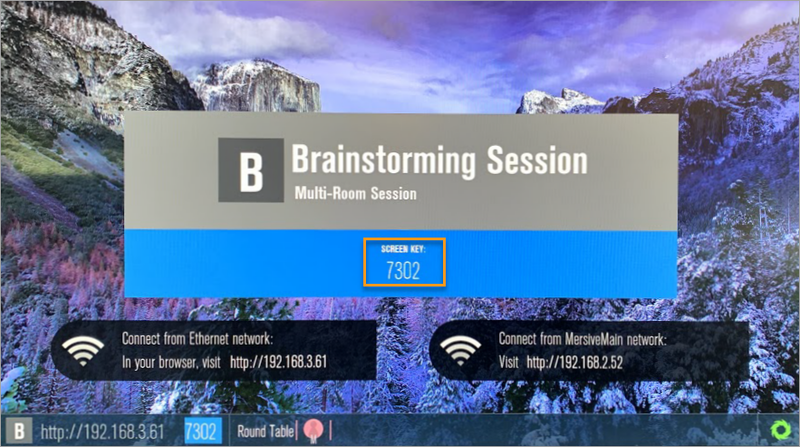 In the same way that individual users can be disconnected from a display by a user with appropriate rights to do so, a room can be ‘booted’ from the session by selecting the room name in the on-screen configuration panel and selecting ‘Disconnect’. Moderator mode operates for Multi-Room sessions in the same way as it does with a single-room Solstice session. In addition to approving new rooms joining the session, moderators can also accept or reject individual user connections, preview content before it is shared to the display, and accept or reject request to post content into the meeting. The key difference is that approval requests will provide additional information about where each user is located. To use moderator mode, it must enabled for the Pod the Multi-Room session is started on. Can anyone start a Multi-Room session? Any user in a Pod-enabled room can enter the on-screen code and start a Multi-Room session. Participants will use the same Solstice client to start a Multi-Room session as they use to connect and share media to any Solstice Display. Users must be authorized on your corporate network to connect to a Pod and will also need to enter the on-screen key before they can start session. These authentication steps ensure that users can’t connect from outside a room with a Pod. How many Pods can join a Multi-Room session? Does Multi-Room support content audio? For example, if I share a video file, will participants in other rooms hear the audio soundtrack? Yes. Multi-Room supports content audio streams from any post being shared from any platform. Solstice does not natively support voice as part of the Multi-Room meeting. Instead, users can add connection information for their existing voice and video conferencing infrastructure to the Multi-Room session. For example, they can add a telephone number to dial into the conference room phone that can be viewed by all Multi-Room session participants.